DALLAS, Nov. 8, 2018 /Christian Newswire/ -- Cliff Gardner went into the hospital for a routine heart procedure and instead became the first patient in the history of the heart hospital to have his heart punctured. He came within seven minutes of dying. "I knew I was saved for an important purpose and when I was gifted a Hold Onto Cross, I knew my purpose immediately. It was as though God put his hands on my shoulders and said that he wanted me to use this unique and powerful religious cross to help introduce Christianity around the world" stated Gardner. The Hold Onto Cross is a unique hand-held prayer cross with finger grips for two people to pray together or one person to cling to tightly while praying. It is handmade in the United States of beautiful mahogany and is 12" x 6". Gardner immediately envisioned distributing these crosses worldwide so he created a company called Praying As One with a mission statement of "Spreading Christianity One Cross at a Time." Please visit the Praying As One website www.prayingasone.com. He took his 30 years of business experience and created a model designed to make money for Christian organizations AND spread Christianity at the same time. The Praying As One model allows Christian churches, schools and missionaries to acquire Hold Onto Crosses at a very low cost (67% off) and then sell or accept donations for 50% to 90% margins to raise money for any worthy need they have. Learn more by viewing the Praying As One Intro Flyers. Praying As One is equally focused on getting crosses into the hands of missionaries around the world. "Can you imagine a missionary jointly praying with someone learning about the love of Jesus Christ and then releasing the cross into their hands to keep and pray with? They would never be alone again" suggests Gardner. Praying As One is so focused on sharing these crosses that they will donate one cross for every two crosses purchased. Their goal is to donate 1,000,000 crosses to positively impact 1,000,000 lives directly plus millions more indirectly. These beautiful hand-held prayer crosses provide tremendous spiritual value and impact, especially when compared to raising monies in more traditional manners such as bake sales, rummage sales, candles, wrapping paper etc. The company is currently seeking to establish strategic relationships with dynamic organizations and individuals that are focused on spreading Christianity. Ideally this would include aligning with some well-intended media members to help introduce this very impactful initiative. Please feel free to contact Cliff at anytime by emailing cliff@prayingasone.com. 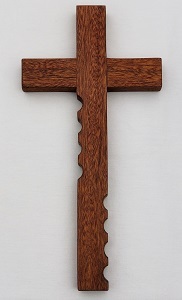 Praying As One is primarily focused on facilitating fundraising and missionary efforts, however, they do offer individual crosses and personalized crosses (brass plates and wood engraving) on their website at www.prayingasone.com for those interested in a single keepsake religious cross. Praying As One is a manufacturer and distributor of high-quality Christian crosses. All crosses are proudly handmade in the United States. The company's mission is to provide their specialty crosses at the very lowest price possible so that Christian organizations and missionaries can successfully raise funds and spread the love of Jesus Christ at the same time.